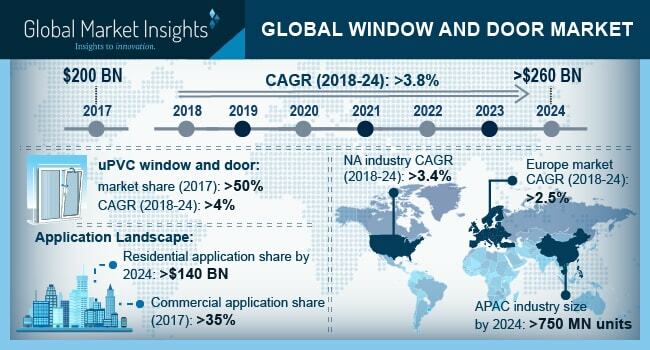 Windows and Doors Market size is estimated to exceed USD 260 billion by 2024; according to a new research report by Global Market Insights, Inc.
Construction industry growth including commercial and residential buildings will boost Windows and Doors Market size. Smart city development initiatives in several countries strongly focusing on improving facilities for citizens are among the key industry growth parameters. Surging government spending in infrastructure development for non-residential and residential buildings fueling product landscape. According to the U.S. Census Bureau, the construction spending has increased over USD 1.25 trillion and 0.7% growth from the previous year. Lower interest rates and construction of post-natural disaster buildings & houses are highly instigating factors stimulating demand across the country. Improved government finances are positively supporting affordable housing schemes in emerging countries including China, Malaysia, Indonesia, and Thailand fueling windows & doors market demand. Rapid industrialization in several countries is strongly influencing the construction sector. uPVC windows and doors market segment registered over 50% of the market share in 2017. Increasing demand for lightweight, low cost, and energy efficient product are the major factors instigating product adoption. Product availability in different colors, textures, laminates, and patterns driving revenue share. uPVC product range provide superior sound insulation and thermal insulation benefits in usage of air conditioners are benefiting energy savings especially in eco-friendly houses and buildings propelling windows and doors market size. Residential Windows and Doors Market will contribute more than 60% market share by 2024. Rising infrastructure development activities worldwide are the primary drivers boosting market size. New construction of houses owing to strong government support in lowering taxes and interest rate positively impacting product demand. Improvement & repairs of houses along with frequent renovation for enhancing interiors designs is likely to witness strong upsurge during the forecast period. Commercial windows & doors market sector is projected to register over 3.5% CAGR up to 2024. Window and door are prominent parts in designing interior with architectural structures of buildings. Rising development activities for new construction of commercial buildings include schools, hospitals, and industries will expand product demand. Asia Pacific windows and doors market registered over 8 billion sq. ft consumption in 2017. Strong revenue generation from major companies owing to rising construction in commercial and residential segment fueling market growth. Surging demand for affordable houses owing to improved disposable income is mainly fueling domestic construction sector during forecast time frame. North America Windows and Doors Market is expected to experience growth more than 3.4% up to 2024. Higher income level in the region leading toward adoption of premium door for domestic and non-residential segments. Windows and Doors Market is highly fragmented owing to the large presence of small companies and local manufacturers in the market. The major companies are LG Hausys, Doorset Solutions Ltd, YKK AP, Pella Corporation, Fenesta Building Systems, RENSON, JELD-WEN, Anderson Corporation and Pella Corporation. Other players are ARBO Window, PT. Sumatera Timberindo Industry, Performance Doorset, ATIS Group, and Vinylguard are notable companies in the market.